The week before school started my wife and I worked hard to try to get our children back into the habit of having a bedtime routine; bath, TV show, snack, books with Dad, and tooth brushing all by 8:30pm. We did great and everyone was well-rested and ready for the first day of school. Then, the night after a happy and busy first day of school, we threw out the bedtime routine we had worked so hard to establish and kept the family out until 10:30pm! 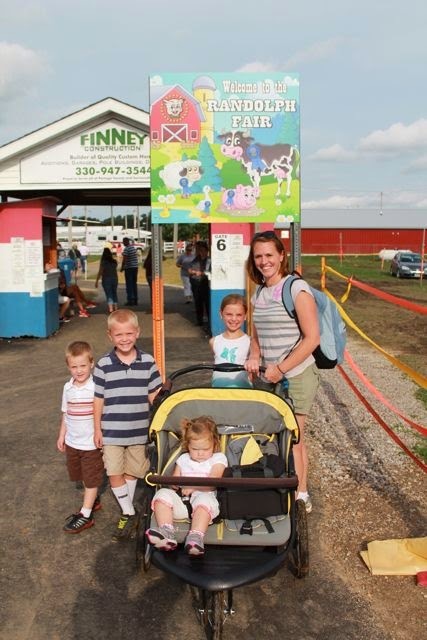 It was worth bending the rules a little for a NIGHT AT THE FAIR! Donald Crews is the illustrator of over 20 books including two Caldecott Honor books that he authored himself, Freight Train (1978) and Truck (1981). He graduated from Cooper Union for the Advancement of Science and Art in 1959 and worked as a graphic artist until he was drafted into the army. He was stationed in Germany for a few years and returned to New York determined to get a job using his artistic talents. In his portfolio was an alphabet book that many people suggested he should send to publishers. (NCCIL). In 1967, We Read: A to Z was published followed shortly thereafter by Ten Black Dots. After the success of Freight Train and Truck he published many transportation books including School Bus and Sail Away. Donald Crews said in a documentary, "I am drawn to real things. I am drawn to things that have some excitement. Things that move. Things that have exciting visual imagery. Trains and trucks and cars and buses. I take a series of photographs, join them together to see if they tell a story. "(Trumpet Video Visits Donald Crews, 1992). I was talking with my wife about ideas I had for celebrating Donald Crews' birthday. We talked about going to a train yard to read Freight Train or walking around the big city to read signs like Truck. She asked about what other ideas I had. 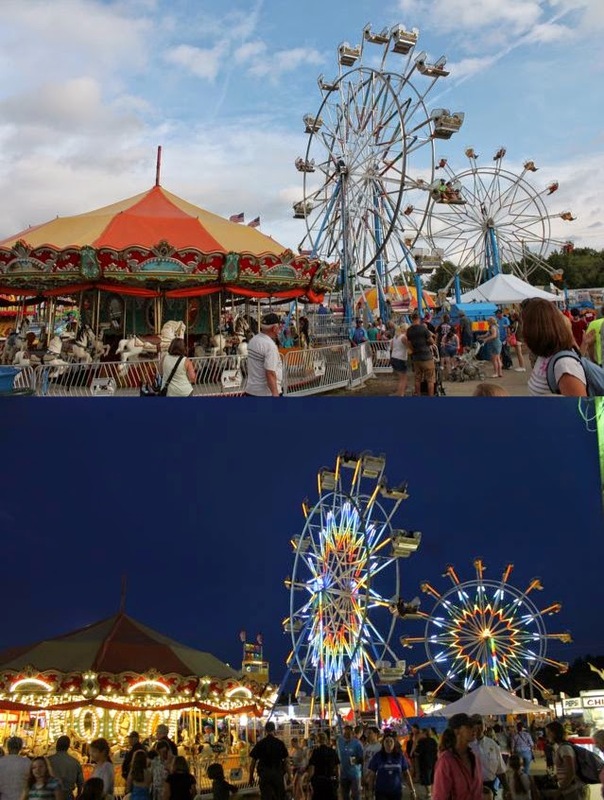 I said, "I really like Night at the Fair, but I don't know if there is a fair happening in our area and if there was one we probably wouldn't be able to fit it into our schedule." She said as she was looking up something on the computer, "I would love to go to the fair....and the Portage County Randolph Fair is going on THIS WEEK! But, the only night we have free is the night after the first day of school." 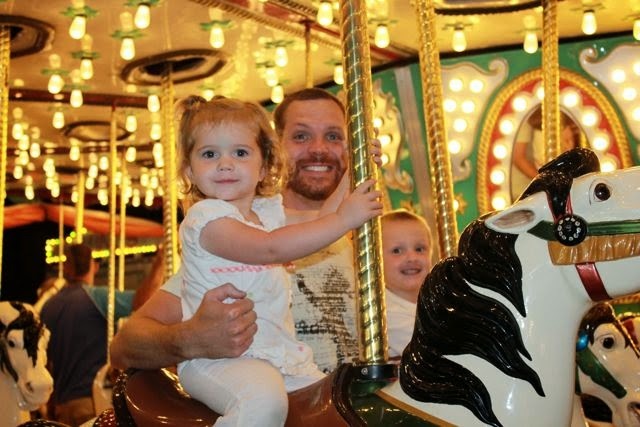 We both agreed that a night at the fair would be worth doing, even if it meant throwing our bedtime routine out the window on the first day of school! The weather looked iffy, but the skies cleared up after school. We packed up the family and headed to Randolph, Ohio. It was quite a feat to reach the ticket gate. The grass parking lot was a mud pit. Many cars were stuck and our shoes got very messy. 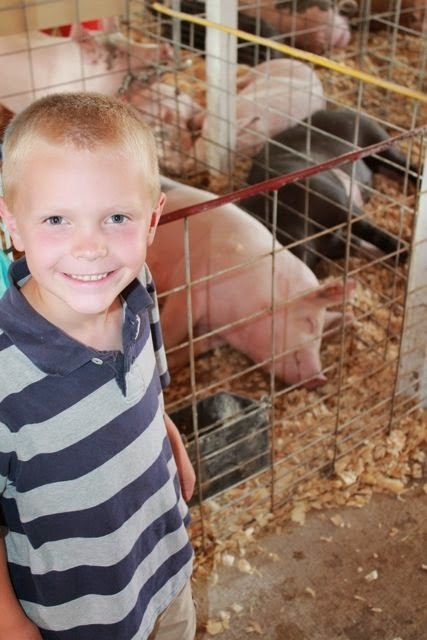 We started our evening by viewing the cows, sheep, chickens, rabbits, turkeys, and pigs. My son noticed this pig was smiling as he slept. We were all hungry for dinner after seeing the animals. 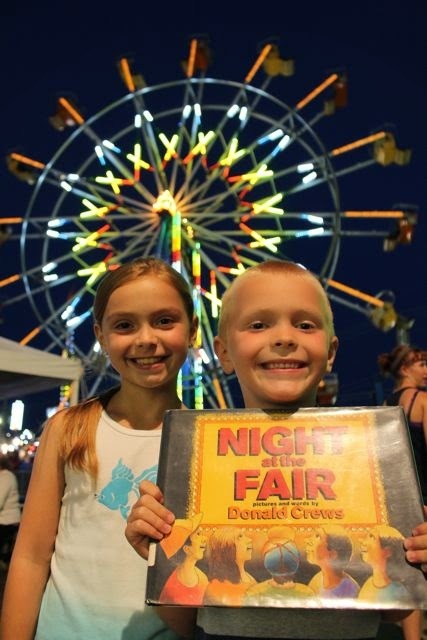 Donald Crews wrote in Night at the Fair, "so many things to eat and drink. So many choices." Everyone in our family wanted something different to eat. Our table was covered with french fries, chicken fajita wraps, calzones, corn dogs, and a WALKING TACO! 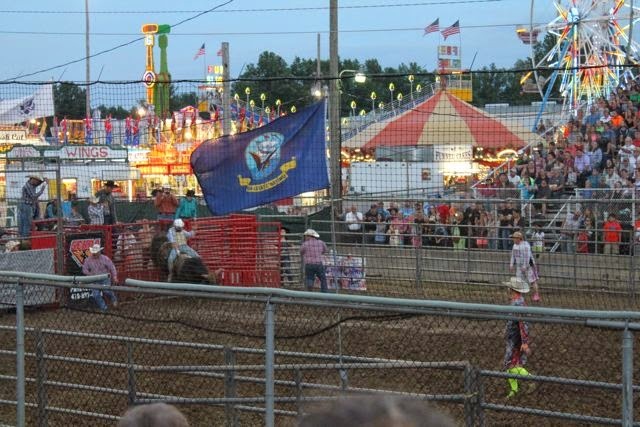 After dinner we found seats in the grandstand to watch the main event; a concert and a bull riding competition. 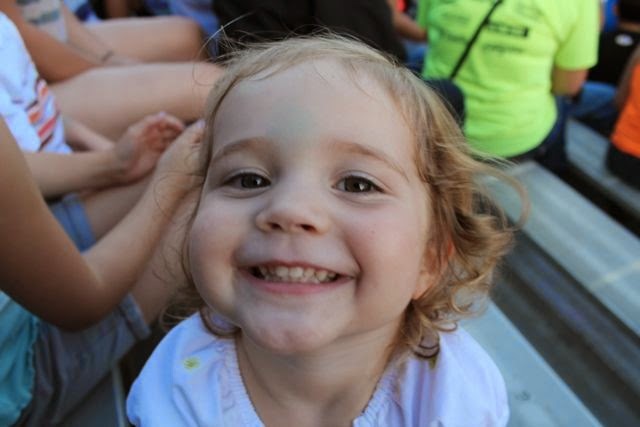 My daughter was so excited to be at the fair. 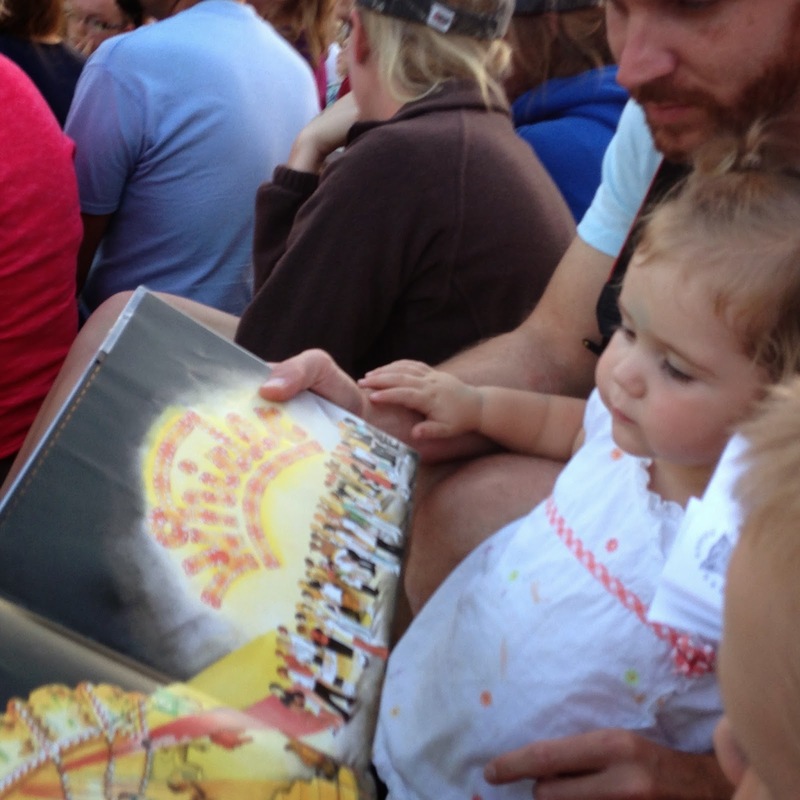 We read Night at the Fair after the concert was over and before the bull riding began. My family and the crowd were really enthralled by the bull riding. However, I couldn't help worrying that someone was going to get hurt. Bull riding is a dangerous sport! 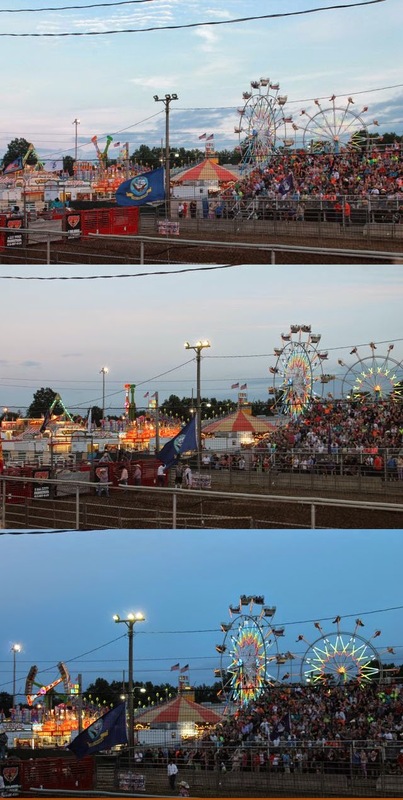 While we were at the bull riding event it became dark enough for the the lights to come on. As soon as we saw this we decided to leave the main event to walk around. I had taken photos earlier in the day and returned to those spots to take a photo at night to capture the magic of the lights at the fair. "The best, the best ride of all, is the GIANT FERRIS WHEEL!" 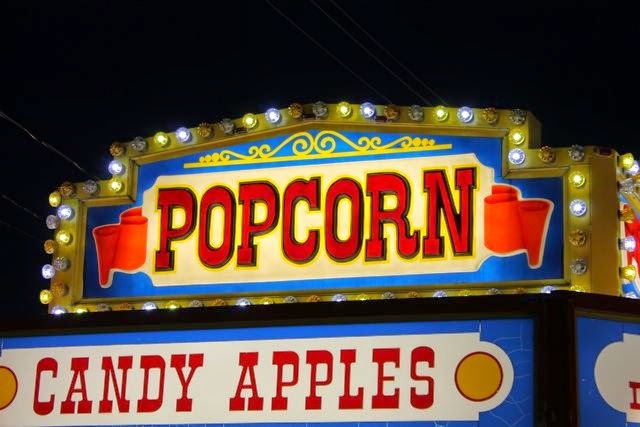 I am sure Donald Crews took photographs similar to this when he was developing his ideas for Night at the Fair. He talked about how he uses photography in the video below, "I think I take photographs at this point more than I sketch things. So, if I need some information I just assume photograph it and use it at some point down the line; for inspiration before the project begins. I think it is helpful just in terms of quickly being able to find something that leads you to color or action or angle. It is a helpful tool." 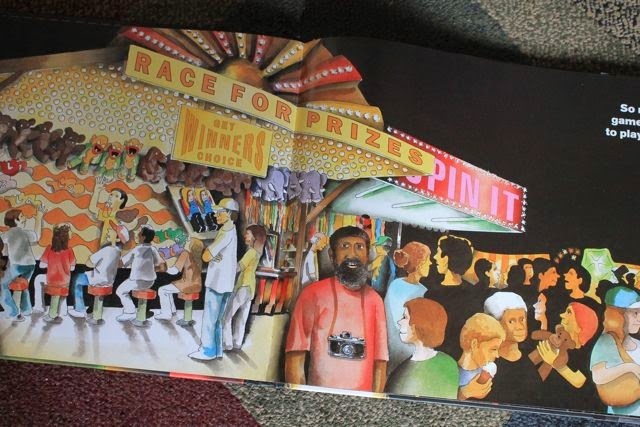 Donald Crews included himself with his camera in one of the illustrations of Night at the Fair. 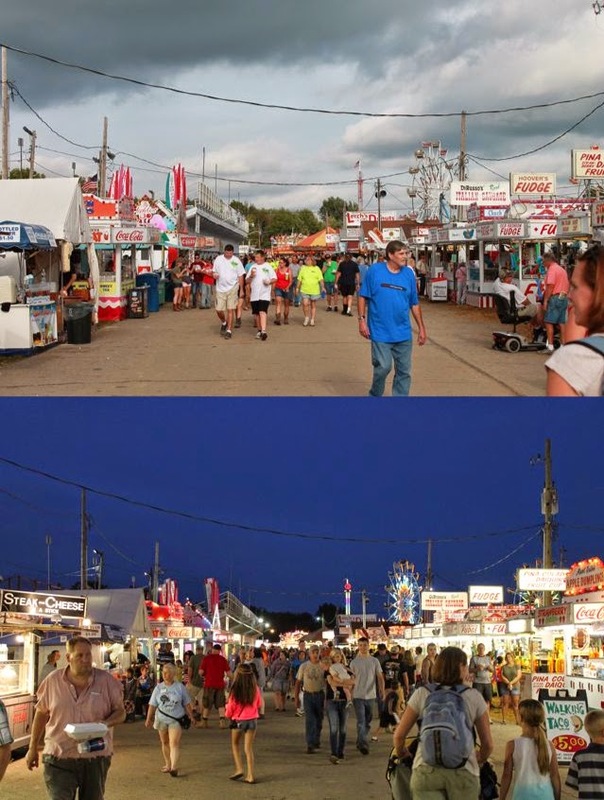 After reading Night at the Fair, I couldn't help but take notice of all the signs and lights. 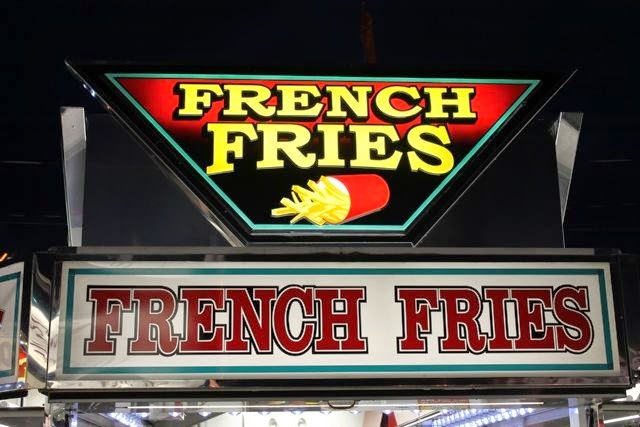 What is your favorite food to have at the fair? "And now, on to the RIDES!" 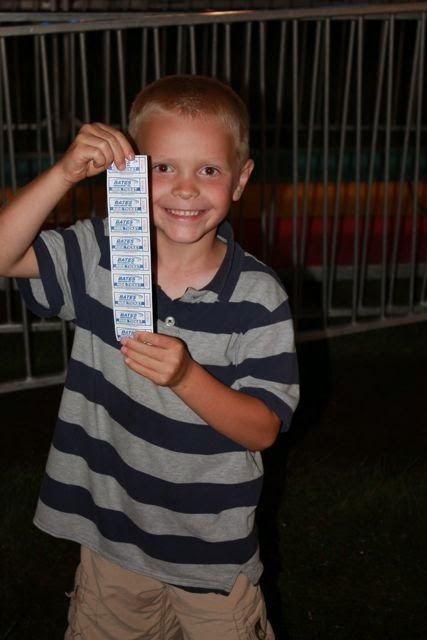 We couldn't go to the fair without buying tickets for the rides. 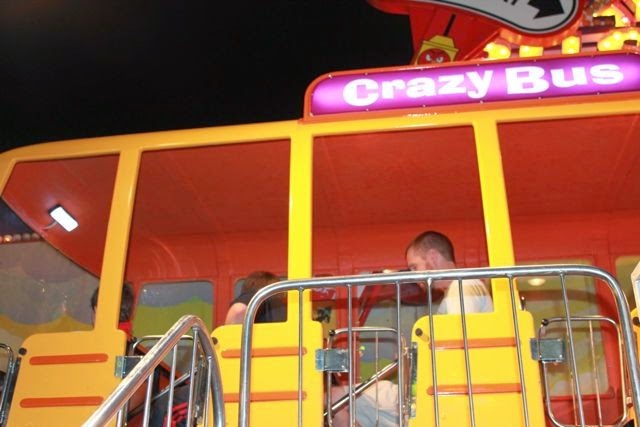 We rode the CRAZY BUS! 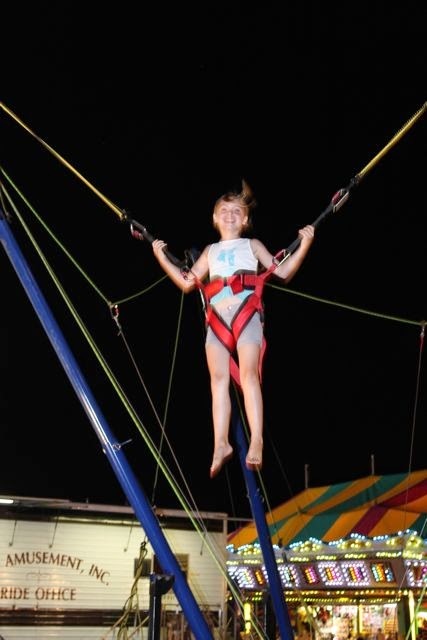 My daughter paid her own way to try the bungee jump apparatus! WOW! What a NIGHT AT THE FAIR!